Tiffany invited me to a vodka tasting on Monday night at Frisson*, on Jackson St. The venue was really cool — very 70s minimalist with an amazing back-lit domed ceiling. After introducing ourselves to the PR folks, we were given the drink menu: an Indian Summer, with huckleberries and I can’t remember what else, and a more citrusy vodka drink whose name escapes me. A vodka tasting? With mixed drinks? I’m not going to say what brand of vodka it was, because I don’t want to disparage something I only tasted as a complement to the amazing huckleberry juice. But if one is launching a new vodka, especially a vitamin-infused vodka, where food critics might be, shall we say, a bit suspicious of the taste, wouldn’t you want to prove that it’s something that works well in a mixed drink and on its own? I feel confident I would have been able to taste it solo had I asked for it, but I find it strange that it wasn’t offered. Further reading: Levitt, Stephen D. “Is Vodka Different,” Freaknomics blog, NYTimes.com. Aug. 31, 2007. My take? Because vodka drinkers prefer an alcohol that, compared to other liquors like gin or whiskey, is tasteless, those people are more swayed by trends than by flavor. Therefore, new “it” vodkas can catch on, become hugely popular, then fade out when the next “it” vodka takes hold. Vitamin-infused vodka will, I’m sure, be huge in the Marina. * The website automatically plays music. Surfer beware. Jason Horn’s bio on his Chow.com stories is one place that mentions it, but nearly everyone who leaves the Bay Area or California laments the lack of Mission-style burritos. Oddly enough, the first time I heard about Mission-style burritos was when I lived in Portland and the nearest place to eat a cheap lunch indoors (a key thing to know when you live in a rainy city) was Taco del Mar. I thought one of the funny things about this post on Emdashes was that tacos were cited as a reason to visit California back in the 1970s. Is that our culinary heritage? So what is a Mission-style burrito? 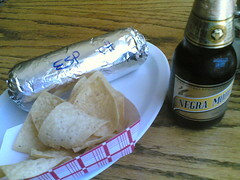 I think, for most of the world, it’s a non-Taco Bell burrito wrapped in tin foil. This Chowhound thread seems to say that the difference is rice, which my friend Prentice would take issue with. She points out — rightly, I think — that the rice is just really filler. Yes, it does absorb the liquid of the salsa, tomatoes, etc., but the quantity of rice in most burritos leaves me feeling that, even for a $5 burrito, I’m paying for more than I’m getting. Of course, Wikipedia weighs in on the subject. My favorite section is the culture and politics. Only in San Francisco would a burrito become politicized. It’s not me, it’s Muni. The Chronicle just ran a story on how Muni is hoping to fix the J-Church, its most tardy line. My favorite detail is how SF voters mandated that Muni show up as scheduled at least 85 percent of the time. 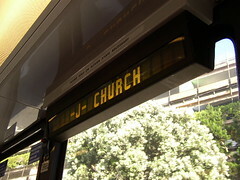 Basically, the program to get the J-Church running on time was postponed while they got the T-Third running, period. The San Francisco Municipal Transportation Agency is seeking regular J-Church riders who are willing to send daily e-mail updates about their trips. How often you ride the J-Church. The days and times you ride. Your telephone number and e-mail address. Whether you’re a senior or disabled. You can also call, but that’s so ’90s. My friend Tiffany just got name-checked on SFist.com. Nice. And no, she’s not actually Matt Smith. But the art show review she wrote for SF Weekly is super funny. P.S. This post officially commences the gradual transition of this blog from my vacation blog to my regular blog. It’ll be fun, I swear. Okay, I have a couple lists to post. But first, a moment of silence for the end of a great SF local music listing site: livemusicisbetter.com.